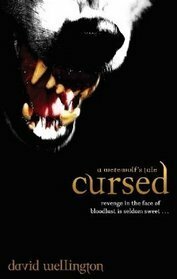 The first book to be reviewed for our Werewolf theme, ‘Cursed: a Werewolf’s Tale’, otherwise known as Frostbite, is an urban fantasy that will blow your mind with panic and horror. A very quick-paced novel with plenty of action that the reader will read in no time at all. David Wellington surely knows how to scare the pants off you and yet allow you to completely endure the ferocious attacks and animalistic behaviour no matter how chilling and raw!!! The story begins with Cheyenne Clark lost, hungry, cold and lonely in the Arctic amid the trees and snow. Before too long she is being tracked by a pack of wolves. Knowing that she couldn’t possibly run from them, and with very little energy, her only chance is to climb a tree high enough so that the pack can’t reach her. However, when howling of another is heard nearby the pack of timber wolves below Cheyenne’s feet soon flee, leaving her sitting on a branch of the tree. Moments later Cheyenne meets with the wolf whose howling she heard. Much larger than the timber wolves and much more ferocious this one tries to reach Cheyenne, jumping at her, lashing at her with large paws. Until he reaches her ankle and manages to claw into her flesh! Although the beast couldn’t quite attack Cheyenne completely, enough damage was done to make Cheyenne’s world come crashing down. She would never be the same again. She was a werewolf, a monster, a Lycanthrope. There are many names for these species and now she herself carried the curse! For every time the moon rises, Cheyenne would transform, having to learn a different way to survive and avoiding the one element that could kill her: silver, silver, silver! Loneliness is not natural for a wolf as they tend to live and move around in packs. As a new lone wolf, Cheyenne could really do with a companion. This proves to be just as difficult as trying to deal with her new ‘self’ as the only one who could truly understand is the one that tried to kill her. Now a wolf, Cheyenne not only needs to worry about being the victim, the prey, but also has to live with being a hunter. Will she kill the one that cursed her? Will he return to kill her? Cheyenne’s character is written with a great deal of contrast from how she feels and thinks as a human and how she is in her wolf state. The natural animalistic behaviour takes over when she is transformed, her sense of smell and hearing is much greater than her sight. As a wolf she doesn’t reason, she doesn’t use logic she survives the only way she can. Back in human form, Cheyenne wakes frozen, naked and never fully aware of what her wolf has done. Without trying to spoil the story one of my favourite areas of the novel was when the reader begins to understand the man of the wolf that attacked Cheyenne, Powell. The reader is educated in Powell’s history as a man and how the curse affected him and we also learn a little of werewolf mythology! I found this to be very interesting and exciting but cannot elaborate more than that. This novel simply needs to be read without much explanation beforehand. It truly does speak for itself! On a different note, David Wellington has written the setting of the scenes beautifully as one can imagine the freezing cold of the Arctic wind, the icy water of the small streams and lakes, all silent and remote from most civilisation with only the sun or moonlight to estimate time. Although not a novel of romance it most certainly is a novel of survival! But can one survive alone? Would one want to survive alone? Or is their only option to try and kill the other to eliminate a dangerous threat? ‘Cursed: A Werewolf’s Tale’ is an absolutely fascinating read. For more fur, fangs and fear I am hoping to read the sequel, ‘Ravaged’, otherwise known as ‘Overwinter’, very soon! As a re–interpretation of the fable Beauty and the Beast, this was a must read for me as it was one of my favourite fairytales as a child! 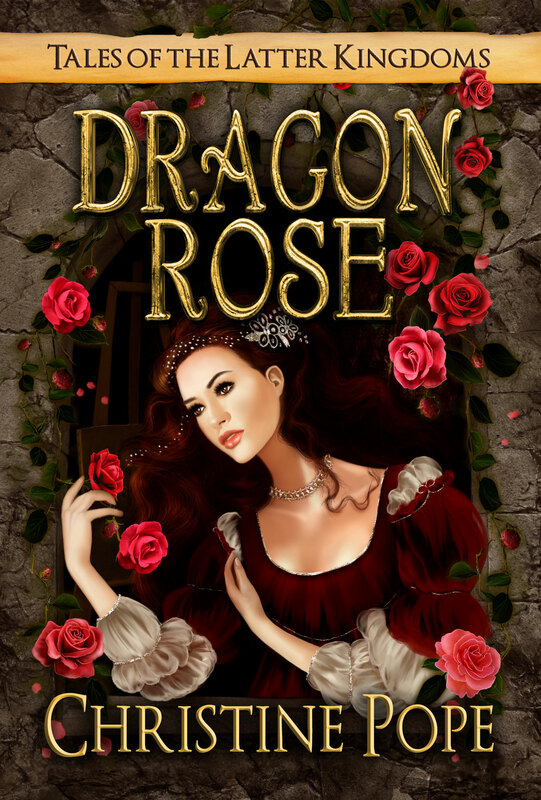 I enjoyed Christine Pope’s, “Welcome to Skullcrusher Mountain” (see my review earlier this month) and Dragon Rose (Tales of the Latter Kingdoms #2) is a compelling read which has you rooting for a seemingly elusive HEA for the cursed Dragon and his Bride! Dragon Rose is set in Lirinsholme, a town that forms part of “the Latter Kingdoms,” lands which have prospered since the end of the mage wars and the decline of magic. Rhianne, a potter’s daughter, is expected to marry well to secure the financial stability of her family and fund dowries for her younger sisters. In ages past, when sorcerers ruled, Theran Blackmoor’s form was cursed by a mage and he become known as the “Dragon of Black Keep.” The town of Lirinsholme, over which the Dragon presides, is bound to provide him with a Bride when he demands one to avoid the destruction of its property and its citizens. All know that marriage to the Dragon means certain death for the unfortunate Brides as none are ever heard of once they enter the Dragon’s keep. Rhianne’s actions inadvertently cause a scandal, which threatens her family’s livelihood and reduces her chances of making a good match. The town also learns that the Dragon is demanding a Bride. Rhianne and all unmarried women between the ages of 16 and 20 are summoned to the selection, where Rhianne’s best friend Lilianth, who is affianced to her sweetheart, is selected, by virtue of her name being drawn. Rhianne volunteers in her stead, leaving Lilianth is free to marry her fiancé and ensuring that her own family is compensated generously for their loss. Rhianne is immediately whisked away to the Dragon’s keep and married to Theran Blackmoor, the Dragon, who has the appearance of a tall, slender man, hidden beneath a cloak and a cowl. Although there is a wedding banquet of sorts, there is no wedding night and Rhianne is given sumptuous chambers, clothes and jewels to wear and is treated kindly by the servants. Theran even indulges her love of painting. Theran initially remains aloof from Rhianne, however, they slowly develop a friendship and Rhianne finds herself falling in love with him. Secrets abound in the castle and Rhianne embarks on a quest to get to the truth of the fate of the Brides and the curse. Rhianne is plagued by vivid dreams, the content of which she becomes obsessed with. She also hears strange voices and grows increasingly melancholic as she becomes terrified of what will be her eventual fate. All seems hopeless but the author manages to secure a HEA with an unexpected twist. Rhianne is a wholly likeable heroine. Although self-sacrificing and modest, she is also unconventional and has a strong determination to find out the truth. Once she is convinced that the Dragon is not going to eat her, she becomes to regard the castle as home. Her attraction to Theran grows over time and she becomes drawn to him more and more as the tale unfolds, although she feels her love is unrequited as whilst she craves his touch he draws away. Theran remains a mysterious figure throughout the early part of the tale, although his kindness towards Rhianne is shown early on. We also witness him in his Dragon form on a number of occasions, which are terrifying to behold. We see that he grows to admire and care for Rhianne through his speech and actions, but like Rhianne are left wondering at his reticence to invite further intimacies and to not reveal fully the details of the curse and what it means for his Brides. The story is told from Rhianne’s POV, which enables us to experience her changing emotions, encompassing feelings of fear, pity, love and increasing desperation first hand as the story progresses. The descriptions the author gives of the castle and the town of Lirinsholme and the rest of the kingdom are vivid. Roses and the rose garden at the castle feature prominently, paying homage to the fairytale we know and love. I particularly liked the way the author’s descriptions of the castle and its environs were used to reflect Rhianne’s increasing melancholy towards the conclusion to the book.